How could the Kingdom of God be within them, or in their midst? Well, they had the Word of God. That’s it, plain and simple. They were the scribes. The Word was in the scrolls they read and taught from in the synagogues and temple. As for the Kingdom of God in their midst – they should have known from the Word who the King was. The Kingdom of God is accessed from the Word of God. 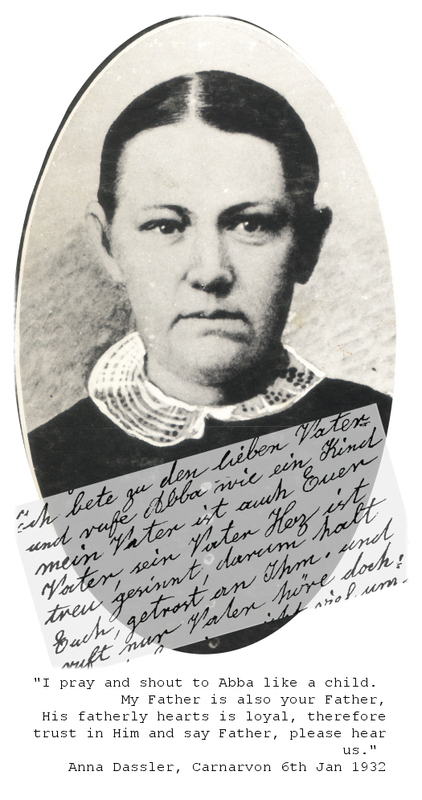 Anna, a young German woman emigrated to New Zealand with her husband Wilhelm and baby son in 1875. She went deaf soon after her arrival and was unable to learn English. After 22 years she was left a widow with half of her eight children under the age of twelve. There was no social welfare back then, her older sons provided for her. She didn’t have citizenship because their papers were destroyed in the bush fires that had raged through the province in the 1880’s. Although Anna could not hear, she was not deaf when it came to hearing from God. His became the only voice she could hear. She heard him by reading his word. A stranger in a strange land, her consolation came from the great words of the Bible. Anna was my great-great grandmother. It was obvious from a couple of very old letters of Anna’s that she’d made contact with the Lord through reading the Bible. Some have described Anna’s letters as ‘religious’. I didn’t see it that way. Even though she was a stranger from another culture writing in German, I felt she was speaking my language. Her letters comforted me. “Trust the Lord in your ways and free yourself of your troubles. Trust His fatherly care, before him nothing is too hard or too large that He cannot guide and lead you by the glory of His name to greater love and happiness. Of all the people and possessions, my saviour is still nearest to me. The Lord sees into your heart.” Anna Dassler. Her words eventually helped guide me back to the Father. It took me a long time to realise that an ancestor’s legacy of faith was God’s gift to me. I came to know the Lord after a gap of three generations. The reason the faith did not get handed down could have been because of hearing and language difficulties and the loss of Wilhelm, or it could have been the presence of Freemasonry in the family. Or it could have been a combination of all of those factors. I had my hearing, but I was deaf to God at first. It took me 20 years before I could hear him. I first heard him at the age of 35 while reading from Hosea in the Bible. Sometimes I’m asked how I am able to hear God’s voice. I look at it like this; he’s an author, and we’re in his story. The Lord is called “the author and finisher of our faith” in Hebrews 12:1-2. We hear him through faith, by taking him at his word. As I said; faith comes from hearing, and hearing from the word. That word is the Bible. It’s the only book that has the power to reach the spirit. On its own can be mistaken for a series of stories, wise sayings, and songs. However it is only through the development of a relationship with the author of the Bible, getting to know his thought processes and connecting with his spirit that we come to recognise the power of his word. What happens when we haven’t read or heard the word? God will use signs, dreams, coincidences, and songs or movies from those prophets of the world who have been inspired to write things that line up with his word. But his normal way of speaking personally to us is through the Rhema word; a word from the Bible for personal application. 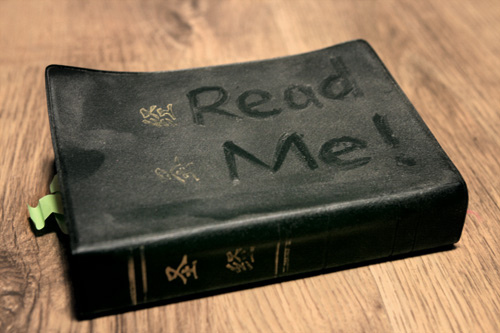 I encourage my son and daughter to read the Bible. I say it’s the most important book they’ll ever read. I know if they read it, hearing will come. But it’s up to them. I hope they will listen to me because the time is late. I do this, understanding the present time: The hour has already come for us to wake up from our slumber, because our salvation is nearer now than when we first believed. Romans 13:11. In my next blog post, I’m going to show you how God is speaking to those who haven’t read the Bible. What is the most controversial prophecy in the Hebrew Bible, and why read it at Passover? The Great Isaiah Scroll on display at the Israel Museum in Jerusalem. 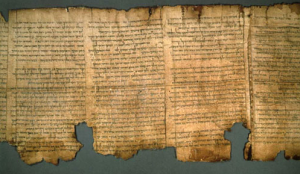 The actual Great Isaiah Scroll (source: The Israel Museum). 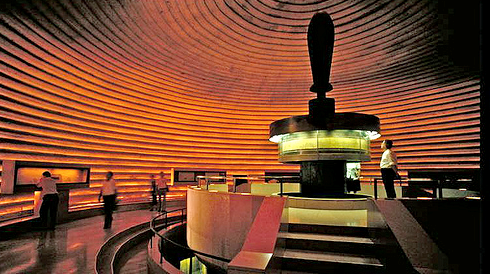 (Central Israel) — Have you ever been to the Shrine of the Book at the Israel Museum in Jerusalem? Have you ever seen the Great Isaiah Scroll on display there? It is absolutely breathtaking. And it contains what many believe is the most controversial prophecy in the entire Hebrew Bible. “Princess Deborah” (my friend and prayer partner) and I had repented of our ways, and were on the rebuild of our lives, starting with our boundaries. We didn’t even know what boundaries were. All we knew was, that we had to rebuild like Nehemiah did. The Lord was VERY interested in what we were doing. He was right behind us in our endeavour. When we needed information about “building the wall,” we asked Him for help. The information was going to be hard to come by, we thought. It was the nineties, and we didn’t have the internet. Coincidentally two friends who didn’t know each other, and didn’t know what we’d asked for, brought me a book and tapes, before the week was out. I could see that the Lord was in the work. He told me when people come to Him in faith asking Him for help in anything touching His will, He delights in it. So we went to work. Nehemiah rebuilt the walls around Jerusalem in 52 days, but it took us longer than that. The day came when I’d had enough of working on boundaries, and wanted to get on with other stuff in the Kingdom. I headed around to Deborah’s and what did I see? A big pile of rocks her husband had bought down from Taupo for landscaping. Yes, it was a big sign to tell us to keep on with the work! Boundaries are important because having them gives control over your life, it enables you to say “yes” to the good and “no” the bad. 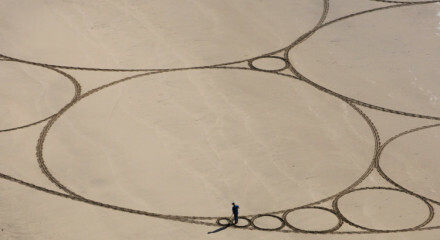 People without boundaries are often compliant and can’t say no, and they attract controlling people who can’t hear no. You know, the ones who if you give them an inch, they’ll take a mile. This is what happened to me and my friend “Princess Deborah”. The Bible says “He that has no rule over his own spirit is like a city that is broken down, and without walls.” Proverbs 25:28 The Lord wants us, with His help, to have rule over our own spirit. 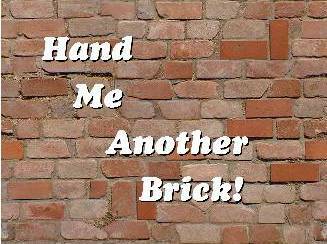 I’ve also found a good sermon on Nehemiah, Rebuilding Spiritual Walls – by Ocean Drive Presbyterian Church, North Myrtle Beach, SC. If you have 1/2 an hour its worth listening to. In my book I wrote a chapter about “Stones,” where I began rebuilding with rubble after a destructive relationship with a narcissist, and some unhealthy friends after him. I had to rebuild my life on a new foundation. The friend I met by a swimming pool in an earlier chapter also was going to have to tear down in order to rebuild. She wanted the same thing for herself and her family that I did. We began meeting over coffee and praying together with our Bibles open. We drew inspiration from a book called “Nehemiah”, about a man who God used to build a big protective wall around a kingdom, out of rubble. I have learned from that time that with the Lord, no experience is wasted. I am grateful for my nightmare experience with the narcissist because it helped me understand what my friend was going through, and with the Lord’s help I came out of it stronger. 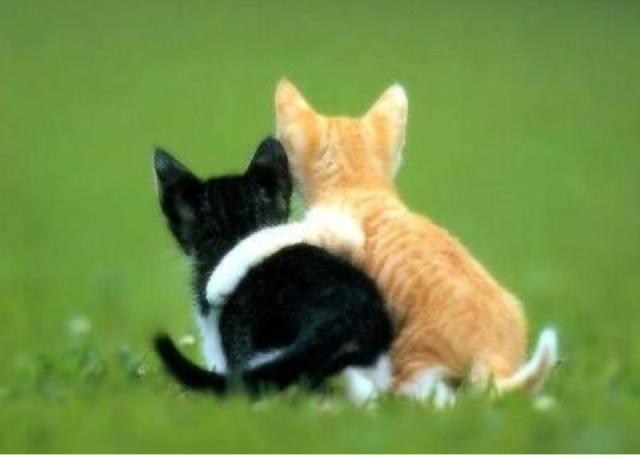 We were able to rebuild standing together, uplifting and supporting each other. The King had given me a word to “rebuild the temple”. He meant “rebuild my life”. It was difficult rebuilding my life after a divorce and abusive relationship with a narcissist. Where did I start? Life had to go on even though I was one of the walking wounded. I had to come to terms with myself and try and figure out what the hell had happened. I felt like I’d had bricks thrown at me, and all I had to rebuild my life with was rubble and other people’s rubbish. It happened because I’d lived life on other people’s terms, seeking my worth in their eyes. Narcissists love to exploit people like that. I lacked rule over my own spirit. At this stage of the journey, I needed boundaries. I didn’t even know what the word meant. What did I have to rebuild with? Rubble, lots of it. 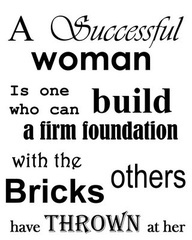 I got started with the bricks. I have learned since then that with God, no experience is wasted. ‘Stones,’ a chapter in my book deals with the vision I got from Nehemiah. He’s a guy who in the Bible who built a wall around a shattered Kingdom. 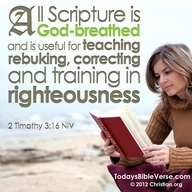 The Bible is called “the Word of God.” The word is “God breathed,” for it comes from the mouth of God. There is the Logos word, and the Rhema word. The Logos is the entire bible, the whole counsel of God, meant for our spiritual instruction and teaching of doctrine. Its God’s Basic Instruction Before Leaving Earth. It has a general application. The Kingdom story chronicles what I heard from the Lord speaking to me through the Rhema word. I’ve treasured the words of the Lord and constructed the Kingdom as a place to store them. Some of the things the Lord told me found their fulfillment several years and chapters later. return to the town you left. I needed guidance in the way I was living, and to know where the Lord wanted me to be. This word instructed me to mark the road I took, to setup signs and guideposts. When I noticed a sign or received a word to guide me, I wrote about it in the Kingdom. The chapters were my guideposts. The second part of the word about returning to the town I left was in answer to a question I had about my place in the world. I wanted to return to Sydney but was stuck in a small town in NZ, bringing up two kids on my own. The word was to “return to the town I left,” but I didn’t know what that meant. The part about “walking around a man in a circle” had me completely baffled, but I recorded it in my story. It was to be revealed in the future.